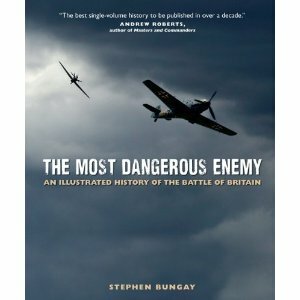 The Most Dangerous Enemy: An Illustrated History of the Battle of Britain by Stephen Bungay - Jimmie Aaron Kepler, Ed.D. “The Most Dangerous Enemy: An Illustrated History of the Battle of Britain” is spectacular. It merits a five-star rating. It is in a large-format of 11.9 x 9.8 x 1.1 inches. The quality of the book is immaculate. If you are a history buff with an interest in the Battle of Britain this is the book for you. The book is divided into three sections: Part 1: Build-up, Part 2: Battle, and Part 3: Aftermath. It takes you on a journey of understanding. You learn of the organization of the air forces. You learn about the various types of aircraft. You learn of the radar and air defenses as well as air craft production. The detail of the information is astounding. The book has over 150 photographs. This includes a large number of rare color photos. The book is a treasure full of color maps and diagrams. There are a number of excellent “sidebar” features as well. Using numerous first-hand experience stories Mr. Bungay brings this critical story from history alive in an exciting way. The quality and quantity of the photographs alone is reason enough to purchase the book. He has many never before published pictures of planes, aircraft pilots, and pivotal military leaders. The diagrams of aerial fights add clarity to the story they illustrate. Well done Stephen Bungay. The book will be an excellent addition to any history buff’s library. Any World War II European Theater veteran will enjoy seeing and owning the book. It would make a great addition to school and community libraries. Reviewers note: I did not compare Stephen Bungay’s “The Most Dangerous Enemy: An Illustrated History of the Battle of Britain” with the original release by Stephen Bungay of “The Most Dangerous Enemy: A History of the Battle of Britain”. That is not the purpose of this review. The non-illustrated “original” book is the definitive reference work that stands. It is the classic on the subject. “The Most Dangerous Enemy: An Illustrated History of the Battle of Britain” is spectacular and deserves to join its predecessor as the illustrated definitive work on the Battle of Britain. Well done Mr. Stephen Bungay!